I hate playing the back-and-forth “what times works for you?” game when it comes time to book a meeting. As a one-person shop, I’d rather spend my time providing value to clients and taking care of more important matters than spend time negotiating appointment times. I use Calendly to make booking appointments easier. I can send people a link to my calendar, and they can pick a time that works for them. This technique also gives off an air of professionalism when dealing with potential clients. A prospect requesting 1-on-1 time is a huge buying signal. As a consultant, these are the people that I want on my mailing list. It would be awkward to ask the person you are meeting with to join a mailing list, so instead I combine a Drip opt-in form with my Calendly. Doing so allows me to create “Book an appointment with me” opt-ins on my site. First, you’ll be creating a new campaign. Keep in mind that your subscribers will see the name of the campaign they are subscribed to; make it user-friendly. Once you’ve created the form, you’ll want to use the ‘create from scratch’ link to make your email sequence. I keep it simple. The sequence is one thank-you email. I ask a couple of questions to get the ball rolling and work out the logistics of the meeting. Once you’ve created your campaign, click ’emails’, then ‘auxiliary emails’, and then ‘sign up confirmation email’. Here we are going to be changing the confirmation text and URL, so it points to our Calendly appointment. There is one caveat: We can’t know for sure if the person booked the appointment or not. I’m hoping Calendly adds a web hook API or Zapier integration in the future. Now set up any automation triggers you want for this campaign. It depends on how you have your Drip account set up. 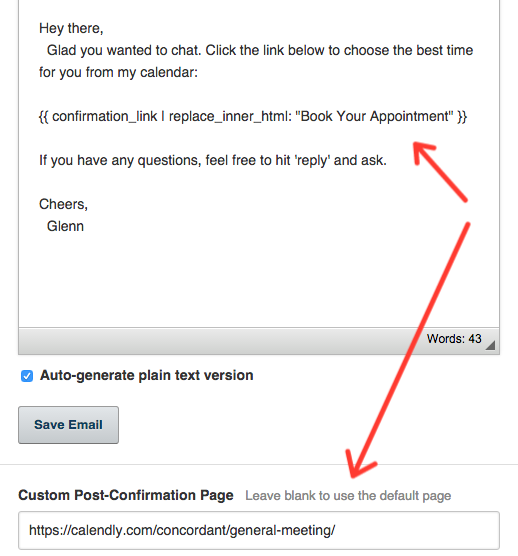 For example, any time I get a meeting request, I automatically create a new lead in my PipeDrive account.